During the period from September 5 to 28, three sesshins (meditation retreats) were held at the Tahoma Zen Monastery. the first and third sesshin (kosesshins) had somewhat shorter meditation schedules while the second retreat, or osesshin was characterized by more intensive meditation. Among about fifty participants, 15 volunteered to have their brainwaves recorded. Of these, 13 were able to serve as subjects on two occasions–once before and once near the end or after the osesshin. The calendar below shows the dates on which each subject’s EEG recording was made. The ‘X’ indicates attendance at the sesshin; the color of the box indicates whether the meditation recording was before (yellow) or after (orange) the osesshin. The protocol for the study had subjects sit quietly without meditating for 5 minutes (Pre), meditate for 15 minutes (Med), again sit quietly for 5 minutes (Post) for the recordings made before the osesshin. After the osesshin, subjects simply meditated for 15 minutes (After), without Pre and Post periods of non-meditation. Results for individual subjects are available from a separate page. It should be noted that conducting a study like this within the sesshin schedule was quite challenging. There is precious little time between the mandatory periods of formal meditation, meals, dharma talks, exercise and work. I applaud the subjects who volunteered to participate in the study during their short rest periods after lunch and dinner. 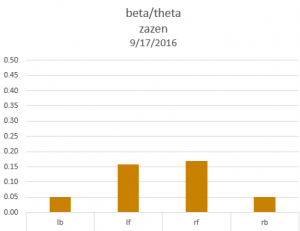 The bar graphs below show the average score for all subjects as per four conditions: Pre and Post (intervals of not meditating), Med and After (intervals of zazen meditation before and after osesshin). Scores for peak prominence at left and right sensors were averaged to obtain values at the front and the back. 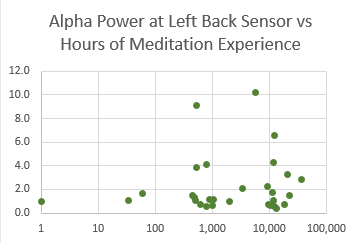 Clearly, the prominence of the alpha peak at the back sensors ((TP9 and TP10) was higher during meditation (Med and After) than for sitting quietly without meditating (Pre and Post). It appears that beta peaks are also more prominent at the back during meditation compared to not meditating. It’s a little less clear what the story is at the front sensors. 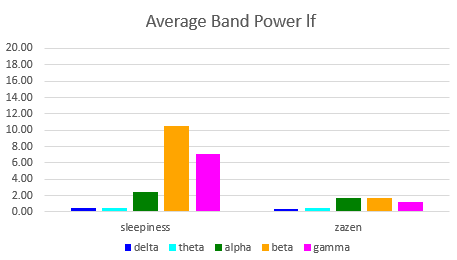 The second analysis compared averages of band power for each of the standard EEG bands. The number plotted on the vertical axis is the average of the inverse logarithm (base 10) of the absolute mean power for the indicated band. By looking at overall power rather than the prominence of peaks, we are seeing something a little different. 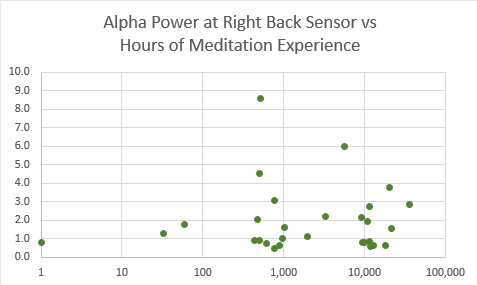 In the case of alpha power, we once again see that oscillations are much stronger at the back sensors than the front, which is what we had expected. But we are not seeing the difference between meditation and non-meditation that we saw in the analysis of peaks. 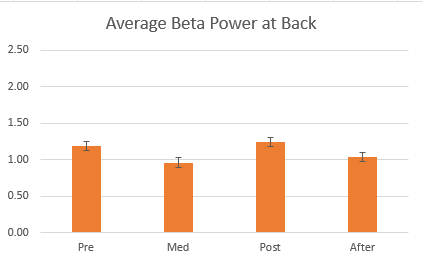 In the case of beta power, front and back are not all that different. In comparing meditation vs. non-meditation it appears that if anything, beta power for non-meditation (Pre and Post) may actually be GREATER (though not by much) than for meditation (Med and After). The result is similar for both front and back sensors. This seems to be a different story from what we concluded from the Prominence of Peaks analysis, suggesting that looking at peaks in the PSD spectrum may be more important than measuring overall mean power. In both graphs, we note that power density varied across the beta band, manifesting itself as peaks. In the upper graph there is a double peak near the top of the beta band, around 28-30 Hz. In the lower graph, there is an additional peak near 17 Hz, as well as a strong peak near the boundary of the theta and alpha bands (about 8.5 Hz). Using only the absolute mean power across either the theta or alpha bands would not have done justice to the size of this peak. While the best way to capture the significance of the peaks would be to mathematically integrate the Power Spectral Density over the width of the peak, this could be a challenging undertaking. 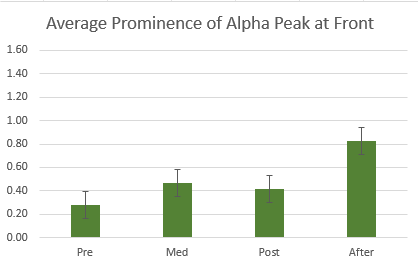 I chose instead to do a semi-quantitative analysis using visual inspection of each PSD graph, along with a graphical key to assign a score from 0 to 3 indicating the “prominence” of the peak. A score of zero means that there is no peak, a score of 3 indicates a very strong peak and scores 1 and 2 correspond to intermediate conditions. The key was built using screenshots of PSD graphs from the sample. 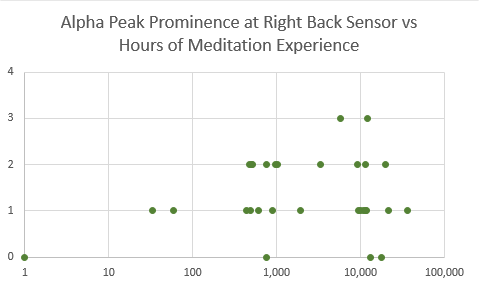 While these plots suggest that the most prominent peaks (score=3) occur for practitioners with several thousand hours of meditation experience, they show that less prominent peaks can also be associated with extensive meditation practice. 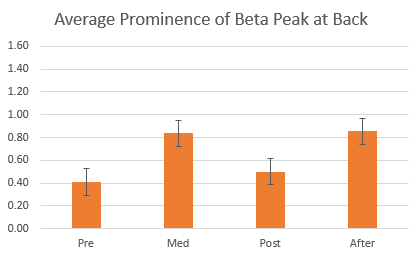 This part of the investigation suggests that prominent (scored as 3) beta peaks in the front and alpha peaks in the back appear among more experienced practitioners but not among novices. On the other hand, there are also experienced meditators who do not show the prominent peaks. So we cannot say that we have found a definitive ‘signature’ of zazen meditation. The previous study which used average mean band power over meditation intervals of 10-15 minutes did not reveal a strong correlation with meditation experience. 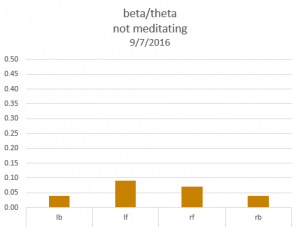 However, a recording made on the 3rd day of a 7-day sesshin showed a linear increase in beta and gamma power over a single round of meditation. Should we be looking not at the average over a whole period, but rather focus on a “best” interval near the end of the period? What would happen if we selected a 2-minute interval near the end of the period and used the mean absolute power for that short interval as a measure of the meditation? It looks as if our analysis using “best 2-minute” intervals doesn’t provide any more suggestion of a correlation between band power and hours of meditation as the previous analysis using the whole interval of meditation. Further investigation was in order. Instead of using the mean absolute power over selected intervals, I chose to examine peaks in the Power Spectral Density graphs as another avenue of research. Meditation practice can be described as skill development—the more hours one practices, the more adept one becomes. to me, it seems plausible that time on the cushion with focused attention has resulted in development. Sometimes my motivation flags and I wonder whether I am wasting my time, but overall, I feel that my practice of zazen has strengthened my awareness of habits of the mind, my recognition of conscious choice and my ability to return to clarity. I presume that my practice is not that different from the practice of others. So what evidence is there for skill development, beyond anecdotal reporting? I believe that there must be physiological correlates of meditation that can be measured and that changes over time should be observable. If this is true, then we would expect to see observable differences between novices and expert practitioners of meditation. 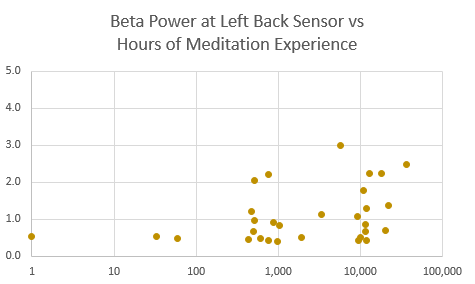 Previously, I had found an increase in beta and gamma power in my own brainwaves during individual meditation sessions and a hint of possible increase in beta and gamma during the course of a 7-day meditation retreat. However, a brief look at the brainwaves of four long-time practitioners revealed no particular commonality. To investigate this further, I extracted EEG data from recordings of 30 subjects. The recordings had been made in different contexts over the course of a two-year period; some were during or immediately after meditation retreats, others were made outside of formal retreats. Some recordings were made in studies where subjects were asked to meditate during part of the session and not meditate at other times. In all cases, data was extracted from segments during which subjects were asked to “count their breaths” or “meditate” or “do zazen.” The reason for merging data from several diverse investigations was to increase the number of subjects in the sample. 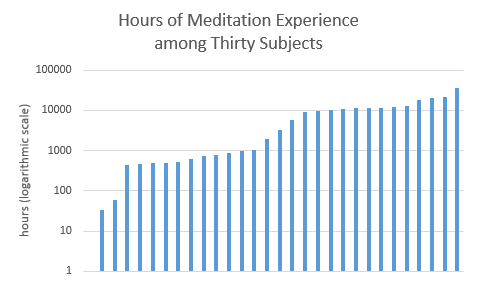 Prior to participation in any of these studies, subjects were asked to estimate the total number of hours of their meditation experience over their whole life. A paper form was given to each subject which included a table to aid in making the estimate. The table had columns for the average time of daily meditation and the number of years of this daily practice. It also included the number of meditation retreats the subject had participated in and the average number of retreat days and hours per day of meditation during the retreat. All the numbers were converted to hours and totaled. While this was a challenging exercise for people, it did help to ascertain a rough estimate for meditation experience. Among these thirty subjects, experience reported ranged from 1 hour to 36,000 hours. It would be interesting if the EEG patterns for highly trained meditators were substantially different from those of novices. I initiated an effort to find out. The next step was to quantify results from the EEG recordings. 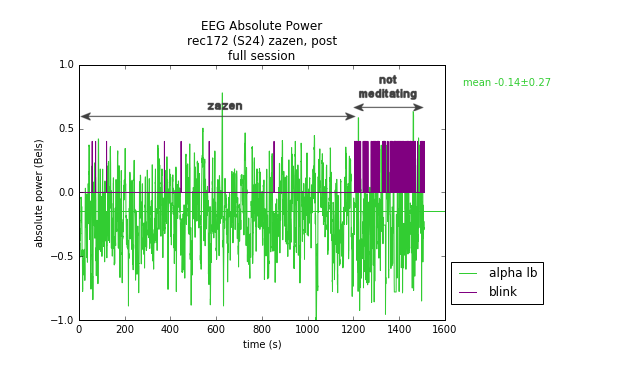 Using the Physiology Viewer application, I identified an interval of roughly 10-15 minutes with a stable EEG signal for each meditating subject. I chose the absolute mean value of EEG power for each of the standard frequency bands (delta, theta, alpha, beta and gamma). 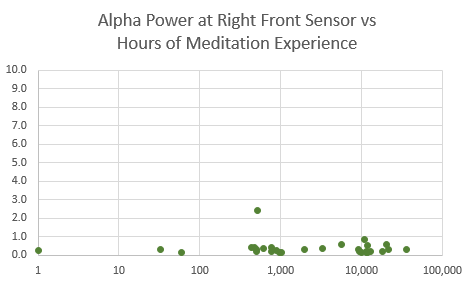 I decided to focus first on alpha power, with the goal of displaying a graph of power vs. hours of meditation experience. Since the range of experience was so large, I chose the horizontal axis to be the logarithm (base 10) of the number of hours rather than a linear scale of hours. The values for absolute band power measured by the Muse are logarithms which can be negative (when the power values are less than 10), so I decided to plot the inverse log (base 10 exponential) of the absolute band power on the vertical axis. This way all ordinate values would be positive. Below are the results for each of the four sensors (lf, rf, lb, rb) for the alpha band. The characteristic that most stands out is much stronger alpha power at the back sensors (lb and rb) compared to the front (lf and rf). This suggests that if we want to use the alpha signal as a correlate to practice, we should focus on the back electrodes (TP9 and TP10). Examining the bottom two graphs, we see no appreciable difference between subjects with ~10,000 hours of experience vs those with ~1,000 hours. Comparing subjects having less than 100 hours of experience (three subjects) with subjects having more (twenty-seven subjects) may suggest that more experienced practitioners had stronger alpha power, but the correlation is weak. Unfortunately our sample included only three people with less than 100 hours experience. If we were to find half a dozen novices with strong alpha, then any correlation with experience would disappear. We just don’t know from the available data. There are several highly experienced subjects in this sample who show no particularly strong alpha signal at the rear sensors. This particular measurement leaves our original question unanswered. 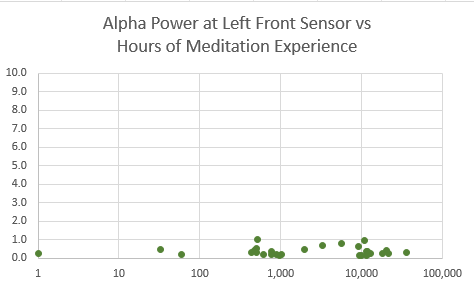 Strong alpha power at locations TP9 and TP10 does not seem to be a predictable effect of long term meditation practice. 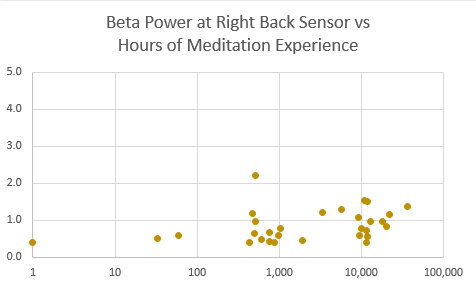 As in the case of alpha power, we see that subjects with the most experience in meditation exhibit a wide range of beta power: some show more than novices; others show comparable values. 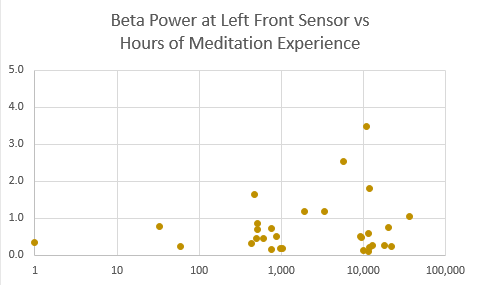 In any case, power in the beta band at either front or back sensors is not a good predictor of meditation experience. The hours of meditation experience reported by subjects on our questionnaire is not a reliable independent variable–our estimates of how many minutes of meditation per day, days per year, and number of meditation retreats are extremely rough, especially when trying to recall many years in the past. Sitting on a cushion and “meditating” can mean different things to different people. Even within a single tradition (i.e., Zen), teachers have guided students with different instructions. Students have had varying degrees of success in applying those instructions. The limited number of four sensors in the Muse headband may be insufficient to register the electrical signature of meditation. 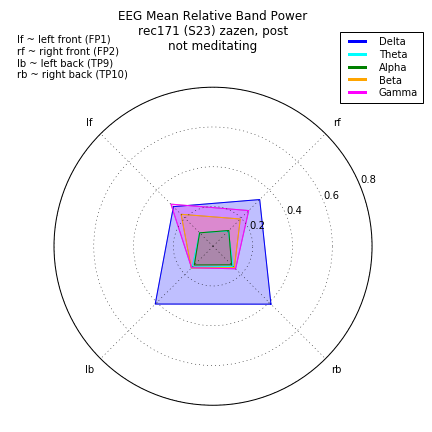 Perhaps none of the EEG frequency bands used in this part of the investigation (alpha, beta, gamma) reflect meditation expertise. Perhaps the choice of using 10-15 minute intervals of meditation and averaging power over the whole interval was not the best strategy. Maybe it took several minutes for meditators to “get into the groove,” in which case, it might be more revealing to select a shorter interval (‘best’?) near the end of the meditation session. The next part of the investigation examined power over these selected ‘best’ intervals. Recently during meditation at home just before bed, I have noticed that I sometimes start feeling sleepy midway through the period and start losing count of my breaths. To monitor this, I made it a practice to clench my jaw briefly whenever I lost count and had to return to “1”. The jaw clench serves as a convenient way to register an event in the EEG signal, as the Muse headband automatically records jaw clench events. In addition to recording EEG, I also recorded my breathing and synced the two signals together. The spectrogram below shows the EEG signal from the left front sensor. Superimposed are the (blue) breath and (red) jaw clench signals. Highly rhythmical breath, alpha band signal (8.3 Hz) and no loss of breath count during the first 10 minutes. ; irregular breathing, missing alpha band signal and loss of breath count (indicated by jaw clenches) during the final 10 minutes. This same phenomenon occurred on four different dates, recorded just before 9:00 pm on February 9, 10, 11 and 15, 2017. I had been looking for correlates in the EEG signal to the experience of losing my focus on counting the breath. I was surprised to find such a dramatic change in breathing pattern whenever I began to lose count. The graphs below show the alpha power at the left back sensor (TP9) in green, the respiration signal in blue and jaw clench events in red. First we notice that at the rear sensors lb and rb, the alpha signal is stronger during zazen compared to sleepiness. 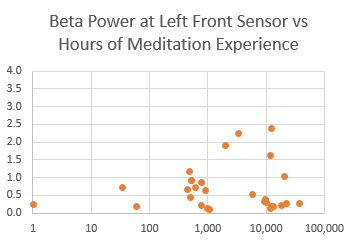 At the front sensors, the story is different: beta and gamma power is stronger during sleepiness compared to during zazen, but interestingly this only seems to be happening at on the left side, at sensor lf. Peaks in the alpha band, recorded at the left rear electrode (TP9) grow stronger with each subsequent zazen period. While not evident in the recording of the non-meditative condition, these peaks appear more pronounced in each successive meditation recording. The frequency of eye blinks while meditating is much less than when not meditating. In addition, there seems to be a trend of decreasing eye blink frequency with greater meditation experience. 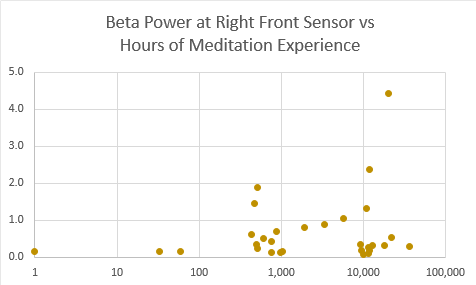 At the front sensors (FP1 and FP2) there seems to be growing power in the higher frequency (beta and gamma) bands relative to a lower frequency band (theta) with greater meditation experience. First, let us examine the Power Spectral Density charts at the left back sensor (TP9) . 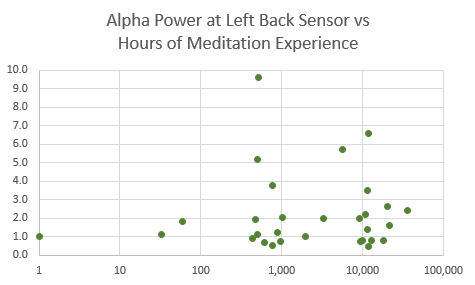 When subject is not meditating, there is no significant peak in the alpha band. The next recording was made a week later, at the end of osesshin. Alpha peaks begin to appear after the osesshin. Investigator: Have you noticed a change in the quality of your meditation during week? Subject: Definitely. Completely. I feel like I kind of earned how to meditate, actually. I don’t know. It’s not like I haven’t done it before. But now it’s starting to click now. Investigator: Was there a kind of a key idea you that you used, or a technique you adjusted to do it? Subject: Learning how to relax. Subject: Yeah. That’s really hard for me. The final recording was made 5 months later after a second osesshin. The subject had practiced meditation about 4 hours per day in the intervening time. Two distinctive peaks appear in the alpha band (5 months after the previous recording). Investigator: How has this sesshin been going for you? Subject: It’s been going up and down. Investigator: How about this particular sitting right now? Subject: I couldn’t really get into the breathing like I wanted. I couldn’t fully relax. Physically, sitting is still hard for me. Investigator: So with your breathing, what were you aiming for? Subject: Comfortable. Something more round. Sort of, that doesn’t feel so forced. Investigator: But you weren’t finding that in is this round? Subject: I didn’t really sink into it, but it wasn’t terrible. Note that there are two distinct peaks two peaks in the alpha band as opposed to just one seen in most other subjects.The significance of this is unknown. No alpha peak for the non-meditating condition. Slight alpha peak during zazen meditation. Small peaks in the alpha band during zazen (after sesshin). Pair of clear alpha peaks after the February 2017 osesshin. Frequent eye blinking when not meditating. Less frequent eye blinks when doing zazen (same recording as above). After the September osesshin, eye blinking is substantially reduced. After the February osesshin, eye blinking has nearly ceased. Radar charts of relative band power for each of the four recordings suggested that higher frequency bands began to dominate lower frequency bands on successive recordings of meditation, after a week-long osesshin and then again after a second osesshin five months later. Delta frequency appears to predominate, but this probably due to frequent eye blinking (see spectrogram below). Higher frequencies (gamma and beta) appear at left front electrode (FP1). 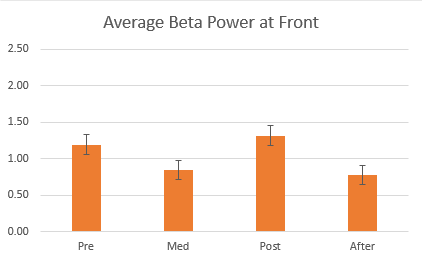 Greater power of beta and gamma in frontal region compared to rear. Beta and Gamma frequencies predominate. Frequent blinking masquerades as a delta band signal as can be seen in the correlation between the low frequency patches (below 4 Hz) in yellow-orange of the spectrogram below on which the eye blink signal has been superimposed. Eye blinks result in registering low-frequency (delta) oscillations so were therefore ignored in the subsequent analysis. See also the post, Sleuthing a delta wave mystery. To get a better handle on the increase in high frequency oscillations with greater practice, we defined a new parameter which represents the ratio between a stand-in for high frequency (beta power) and a stand-in for low frequency (theta power). Values were normalized to be positive. Results are given below. 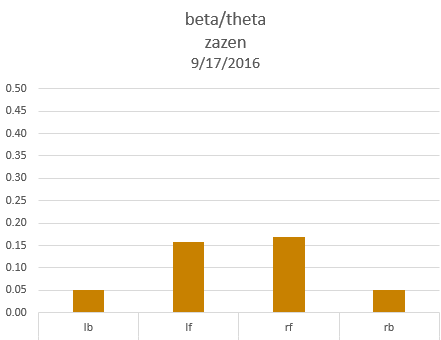 The ratio of beta to theta power seems to support the hypothesis of increasing high frequency oscillations in the frontal area with greater zazen practice. Generally zazen practitioners meditate with their eyes open–if not wide open, then partially open with a soft focus. Eyes are directed forward and slightly downward. 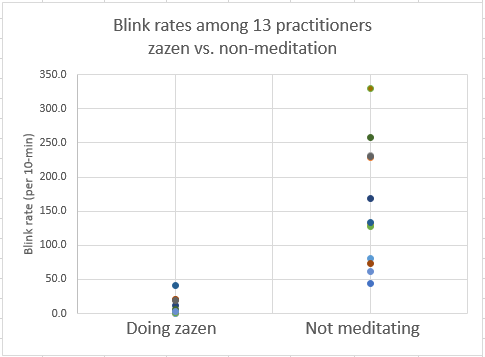 An unexpected finding of this study is that zazen meditators exhibit much lower rates of eye blinking when they are doing zazen, as opposed to just sitting quietly. The Muse headband automatically records eye blinks, so this was an easy comparison to do. During the September osesshin, four subjects were asked to do zazen for the first 20 minutes, then to stop meditating for the final 5 minutes of the recording session. A group of nine subjects were asked to sit quietly for 5 minutes without meditating, then do zazen for 15 minutes, then stop meditating for the final 5 minutes. The time series graphs below show examples of recordings in which eye blinks are superimposed upon absolute alpha band power. Subject begins with 20 minutes of zazen, followed by 5 minutes of sitting quietly without meditating. In the first 5 minutes, subject sits still without meditating. For the next 15 minutes subject is doing zazen. In the final 5 minutes, subject sits without meditating. Blink rates for 13 meditation practitioners. Among 13 subjects, the average blink rate during zazen was 9.9 blinks per 10 minutes, while the rate during sitting quietly without meditating was 161.4 blinks per 10 minutes. Eye blinking during zazen was reduced by a factor of 16 compared to sitting quietly without meditating. I will be looking for volunteers at the September 2016 sesshin at Tahoma Zen Monastery to participate in an investigation of brainwave patterns. The schedule includes a 4-day kosesshin Sept 6-9, a 7-day intensive osesshin Sept 12-18, and a 7-da7 kosesshin Sept 21-27. 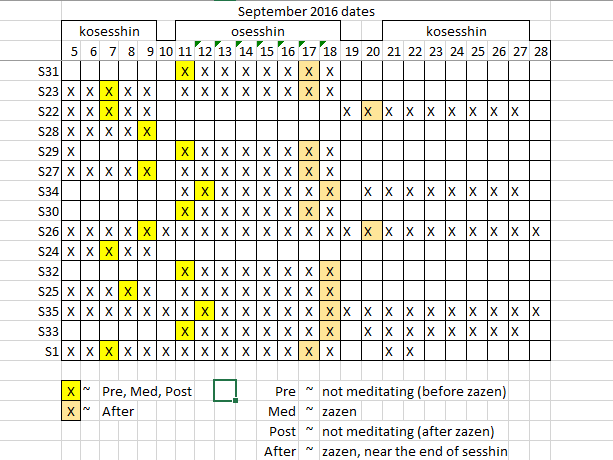 Having fewer hours of formal meditation, the two kosesshins provide opportunities to schedule EEG recordings during free time. There will be two goals in the study: (1) to look for pre/post differences in brainwave patterns for individuals participating in an intensive 7-day meditation retreat, and (2) to look for patterns associated with focused meditation vs. mind wandering. If you will be attending any or all of the upcoming sesshins in September and you would like to participate in the brainwaves study, please send me an email or fill out the comment form below and we can schedule recording sessions. I would like to have participants estimate their total lifetime meditation experience (hours of formal practice) on the release form which can be printed and turned in at the time of your recording. As discussed in a previous post, alpha waves account for the most common frequency peak for individuals relaxed and sitting quietly. It appears in most people during zazen meditation. The alpha peak, usually centered around 8-10 Hz is stronger in the region near the ears (lb and rb) than in the front (there is general agreement that alpha oscillations originate in the occipital lobe of the brain, at the back of the head. It is most easily observable when the subject’s eyes are closed. We have observed some other frequency peaks, generally at higher frequencies (beta and gamma) that appear occasionally in the EEG signal. 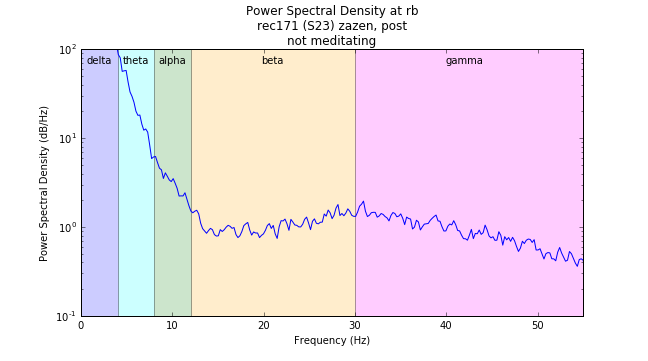 Consider the following spectrograms for the signal from the rb sensor from four different individuals with a wide range of meditation experience. 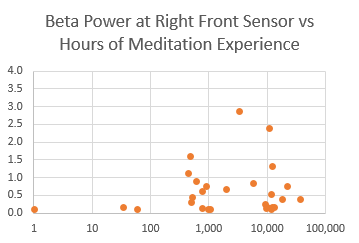 Subject S1 has roughly 5,000 hours of meditation experience. Here the alpha oscillation at 8 Hz is most prominent, which a second oscillation at 28 Hz is also visible. Subject S6 has about 13,000 hours of meditation experience. Interestingly, there is little evidence of alpha oscillations, but oscillations of about 28 Hz are clearly visible. Subject S4 has less experience with meditation. We see an alpha oscillation at 8 Hz, nothing at 28 Hz and a very clear oscillation at 50 Hz. Subject S17 has no previous experience with meditation. Here we see very little alpha, but considerable power at 28 Hz. Below are the corresponding PSD graphs for these sessions. We see not only the prominent alpha peak at 8 Hz in some (but not all) recordings, but also peaks at 28 Hz and 50 Hz in some. The 28 Hz and 50 Hz peaks do not appear in all recordings and are not necessarily registered at all sensor locations. For subject S4, the 50 Hz peak was strongest in the right front sensor (rf), but for subject S6, the 50 Hz peak was strongest in the right back sensor (rb). The 28 Hz peak is strongest at different places for different individuals. Subject S1 had the strongest peak at location rb, subject S6 at lb, and subject S17 at lf. 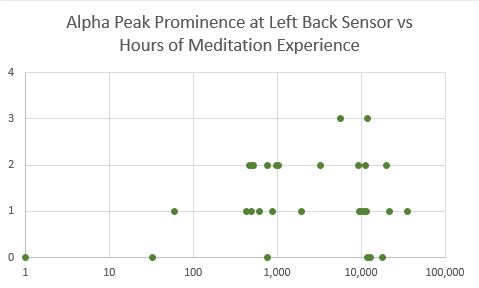 What is remarkable about these peaks is that they seem to have the same peak frequencies across different recording sessions and different individuals with varying meditation experience. When they do appear, they appear at 8 Hz, 28 Hz and 50 Hz. There is nothing to suggest that the 50 Hz signal is an artifact from electrical line interference, as these recordings were done in the U.S. where the line frequency is 60 Hz. Also, it does not appear in all recordings, even recordings made on the same day. This suggests that the 50 Hz oscillation is indeed a signal from the cortex. For a long time, I have wondered whether my brain waves change with the rhythm of my breath. Can we observe characteristics of the EEG signal that correlate with the pattern of inhalations and exhalations during zazen? I wanted to test this during the February 2016 osesshin at the Tahoma Zen Monastery. But first I needed to make sure that data in the EEG signal were synchronized with the respiration data. Since these two signals were coming from two separate devices, I needed to devise a system (which I describe at the end of this post) to insure that the two data streams were in sync. Let us take a look at a 25-minute recording made on Day 6 of the sesshin. Following instructions from my teacher, Shodo Harada Roshi, I have been working on extending the exhalation as long as possible. Here is a spectrogram for the left back (lb) sensor. The most prominent feature is the strong alpha oscillation at around 8 Hz, which we can verify by looking at the PSD spectrum for this interval. At the lb sensor, we see a strong oscillation at 8.3 Hz. Now compare this with the spectrum for the left front sensor, lf. 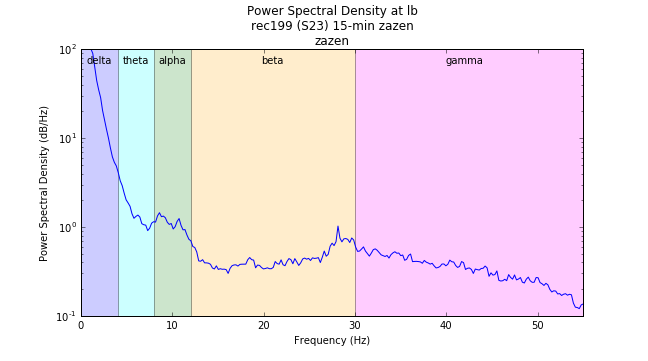 The Power Spectral Density graph for sensor lf shows an alpha peak at the same frequency 8.3 Hz but at much less intensity (about 2.4 dB/Hz) compared to sensor lb (about 100 dB/Hz). In addition, there is considerably more power in the higher frequencies (beta and gamma) than we saw for lb. 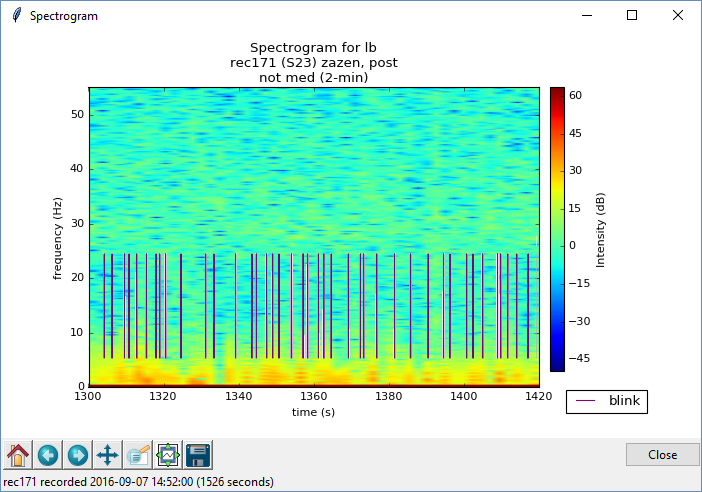 Now let’s take a closer look at the spectrogram for sensor lf. The alpha band is diminished (faint yellow horizontal strip near frequency 8 Hz). The frequencies from about 15-50 Hz are more prominent– note the orange smear centered from about 20-30 Hz. But this spectrogram shows something else that is very interesting: the vertical bands with a semi-regular spacing. What could be the cause of these bands? At first, I thought maybe they were some kind of mathematical artifact. But when I took a look at the time intervals between successive bands, another idea came to me. There are about 11 bands in an interval of 200 seconds, which is equivalent to about 3.3 bands per minute. But 3.3 per minute is a typical zazen breathing rate for me on the latter days of a sesshin. Could these bands be correlated with breathing? 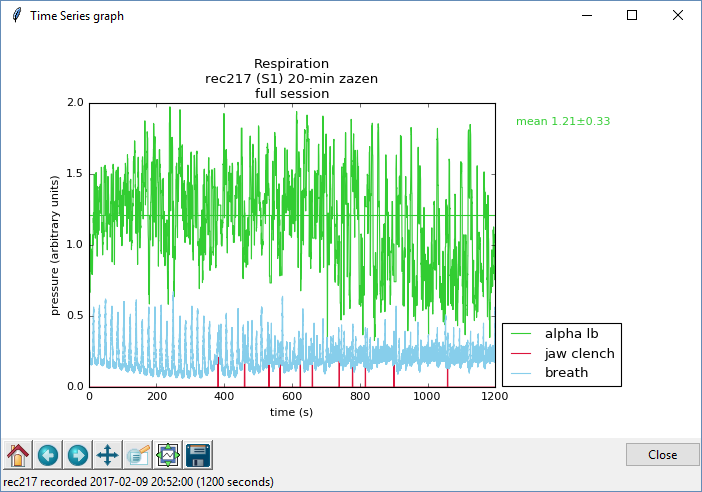 To test this hypothesis I added a new feature to the Physiology Viewer 2.0 program, making it possible to superimpose the respiration signal on the EEG signal. 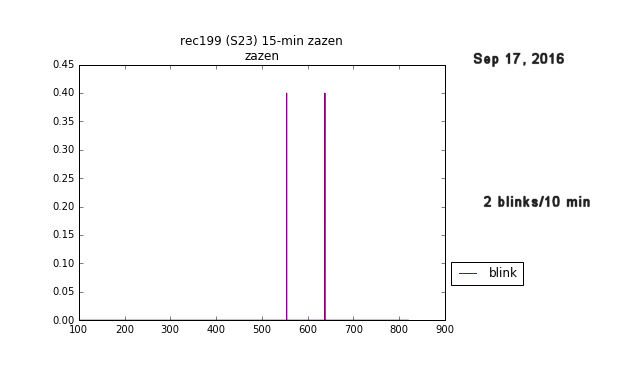 Let’s first zoom in on an interval, say from 880 – 1030 seconds. This is the spectrogram we get. We see the bands clearly in the EEG. Now let us add an overlay of the breath signal. Remember that the respiration and EEG signals have been synchronized. So we see that the growth in high frequency power (left side of yellow bands) begins with the inhalation, continues during the exhalation and then drops off (right side of yellow bands) during the extended exhalation. Below are spectrograms for a recording done two days earlier (Day 4 of the osesshin). We see the same pattern as before. In fact, when I go back and look at other recordings of the February 2016 sesshin, I see these bands in nearly every case. The bands are most pronounced in the left front sensor, lf, relatively weak in rf and often altogether missing in sensors lb and rb. Looking back at other recordings from the February 2016 sesshin, I find that MOST of them show the high frequency bands at sensor lf. It is harder to find evidence in the recordings of other subjects, but I did find one case. Subject S12 has 21,000 hours of meditation experience. In this recording he is practicing shikantaza with his eyes closed. Vertical yellow bands indicating changes in intensity of high frequency oscillations (from about 20 – 40 Hz) are evident and correlate with his breathing, becoming less intense during the long exhalations. Our EEG signal comes from the Muse Headband where each data point is time-stamped using the system clock. Elapsed time is computed by subtracting the initial time when the Record button is pressed. 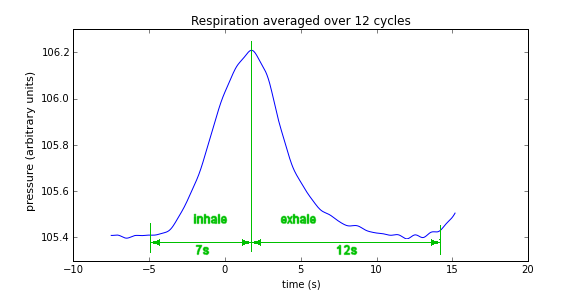 The respiration signal, on the other hand, comes from the Respiration Monitor connected to the LabQuest recorder where timestamps start at zero when the Record button is pressed. Therefore, to ensure that the two signals are in sync, we need to start the recording in each program by pressing their respective Record buttons as close to the same time as possible. An automatic mouse clicker program fit the bill. Auto Mouse clicker is available from Murgee Softwares. We set up a script that automatically clicked the Record buttons on the two recording programs within a millisecond or so. During one EEG recording session, a subject was asked to first meditate by following her breath for 7 minutes, then to start worrying about something for the next 7 minutes. She chose to worry about work. We see in the spectrogram below, around t=420 seconds (7-min), there is a distinct increase in low frequency oscillations at the delta and theta levels. A spectrogram is in effect a three-dimensional graph: time on the horizontal axis, frequency on the vertical axis and color patches to indicate the amplitude of each frequency component at successive times. Here we see greater intensity (indicated by orange and red color) in the lower frequencies after the 420-second mark. We can also use radar charts to examine the relative power for each of the five frequency bands. the following two charts apply to the initial 7-minutes of meditating and to the next 7-minutes of worrying. What is going on here? Why should the relative delta power be so strong when the subject is worrying? Aren’t delta waves associated with deep sleep? Before continuing, we should examine the possible effects of certain artifacts in the EEG signal, especially those due to blinking the eyes. Motor impulses to the eye muscles produce electrical signals that are picked up by the EEG sensors, but these signals tell us nothing about activity in the cortex. One possible explanation of the exceptionally high amplitude of low frequencies is that during the interval of worrying the subject blinked frequently while in the preceding interval of following her breath, she blinked only occasionally. To explore this further, we made a recording in which another subject (S1) blinked deliberately at a rate of about once every two seconds for 20 seconds. Below are the spectrogram and immediately below it the time series graph of eye blinks. During this 40-second interval of interest, the subject blinked 11 times in 20 seconds. It is quite clear that eye blinks result in low frequency oscillations that are readily visible in the corresponding spectrogram. Could it be that our worrying subject was blinking her eyes more frequently during worrying than she was while meditating? Selecting time series plots of eye blinks for intervals of meditating (following the breath) and worrying, we see a distinct difference. This seems to be the most plausible explanation of the high levels of delta oscillations observed: our subject blinked her eyes much more often when worrying than when meditating. These signals probably originated in eye muscles rather than in neurons in the brain. Alpha waves are generally defined as neural oscillations in the range of 7.5 Hz to 12.5 Hz. They represent the strongest electrical signals on the scalp and were first discovered by German neurologist Hans Berger in 1924). Alpha waves originate in the occipital lobe (back of the head). They are especially prominent during a state of relaxation with the eyes closed. 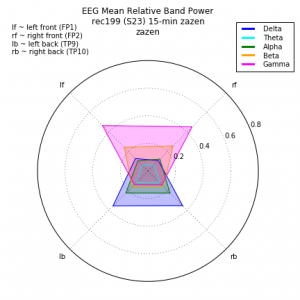 Due to their characteristically high power, alpha waves are the easiest EEG signals to pick up. In order to determine the precise frequency of alpha waves as well as other neural oscillations, we implemented Power Spectral Distribution (PSD) graphs. These graphs plot the spectrum of a given EEG signal, i.e., the intensity of the signal (Db/Hz) vs. its frequency (Hz). The y-axis is logarithmic with a range from 0.1 to 100 and the x-axis is linear in frequency. 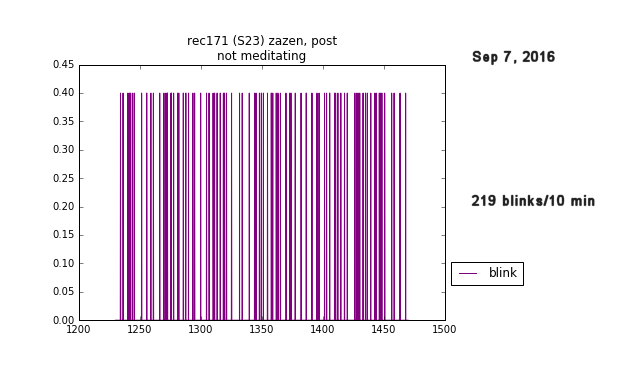 The example below shows the spectrum of the signal from the left back sensor (TP9) during a four-minute period of zazen (counting the breath). The tip of the most pronounced peak falls at 8.18 Hz, at the bottom end of the alpha band. The alpha peak is apparent in all four sensors, most prominently in the left back (TP9) sensor but also in the right back (TP10), and the sensors left front (FP1) and right front (FP2), as seen below. Note that the alpha rhythm is stronger in the region near the ears (lb, rb) than in the front (lf, rf). For a single individual (myself) over a period of twelve months, this peak has been stable during zazen practice. Across 34 sessions, the mean frequency has been 8.2 Hz with a standard deviation of 0.2 Hz. In recordings of other people, the same peak can be seen, but at slightly different frequencies. 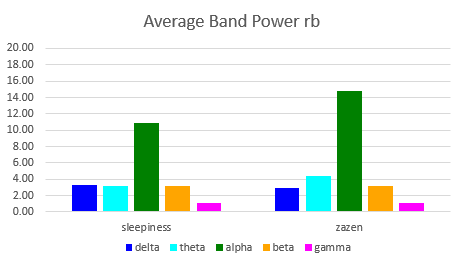 The alpha band feature is quite robust: it seems to occur in most people, especially if they are relaxing. It occurs reliably when a person’s eyes are closed, and can also occur with eyes open as long as the eyes are relatively still and not moving about. 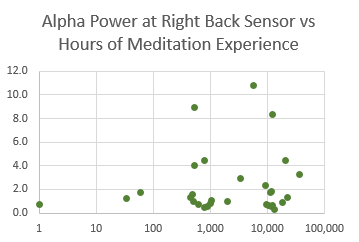 Among 11 different individuals of wide-ranging meditation experience, the range of the alpha peak was from 8.1 Hz to 11.0 Hz. The mean frequency was determined to be 9.4 Hz with a standard deviation of 0.8 Hz. Thus the spread of the alpha peak frequencies across different individuals is over four times as wide (0.8 Hz vs. 0.2 Hz) as the spread of frequencies for a single individual. Returning to the original recording of one individual, we see segments for three separate conditions: reading, following the breath, and counting the breath (eyes open for all three segments). Below is a spectrogram of the full session. The alpha power is stronger during meditation (following or counting the breath) than it is during reading. This is indicated by the strong horizontal yellow line at frequency 8 Hz for the meditation conditions and its near absence during reading. The PSD charts for each of these three intervals, measured at the left back (lb) sensor provides more detail on the predominate frequencies. Values for alpha peaks are reading: 4 dB/Hz; following (eyes open): 32 dB/Hz and counting (eyes open): 40 dB/Hz. A strong alpha peak is not necessarily a signature of meditation, but reading definitely suppresses the alpha oscillations compared to two kinds of meditation with eyes open. 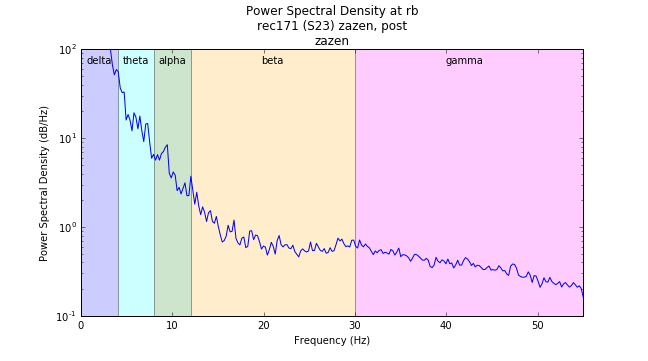 Our next task will be to use Power Spectral Density graphs to examine other regions of the frequency spectrum, in delta, theta, beta and gamma bands. With new graphing tools available in the Physiology Viewer 2.0, previous recordings can be reexamined and studied in more detail. September 10, 2015 was the 5th day of a 7-day sesshin (meditation retreat) at Tahoma Monastery. At the end of the day, after the last round of formal meditation, I recorded my brainwaves, as I did each day of the retreat. Below is a graph that was derived from an EEG recording of fifteen minutes of meditation. It shows signal power for beta and gamma frequency bands measured at the left front sensor. We note that for a period of about 400 seconds near the beginning, there is a gradual and relatively uniform increase in beta and gamma power. Let us focus on a region of interest, the interval from 50-450 seconds. We replot the graph for the region of interest and then label two sub-regions, each two minutes long, “first 2 min” and “4 min later”. The purpose of this is simply to have an earlier and a later region to compare. Characteristics of the two intervals can also be compared by examining the two radar charts below. In these charts, absolute band power for all four sensors is included. The signal at the left front sensor is of particular interest as it shows a significant increase in beta and gamma power. The Physiology Viewer, shown below provides new ways of examining the data. In particular, a spectrogram and a Power Spectral Density (PSD) graph are part of the suite data visualization tools. We have chosen to identify two 120-second intervals with the names “zazen – first 2 min” and “zazen – 4 min later”. Selecting these individual intervals allows us to examine the EEG signal in more detail. A spectrogram is a graph of frequency vs. time. Frequency is plotted on the vertical axis and time along the x-axis. We select the Spectrogram for the left front sensor (lf) during the entire session. The result is a frequency vs. time graph where the intensity of each frequency is indicated by color. Here, yellow indicates greater intensity than blue. The associated color bar serves as a legend. Note that during the “first 2 min” interval, there is less yellow in the frequency range from 12-50Hz (and hence, less power in the beta and gamma bands) than there is during the “4 min later” interval. In addition, a horizontal yellow band runs through the entire session at a frequency value of about 8 Hz. This is in the alpha band. It will be readily apparent when we view these data using PSD graphs. Note: Regarding the ‘vertical bands’ in the spectrogram, see a later post, Correlations of brain waves with respiration cycle. The PSD graph displays a spectrum of the signal. Frequency (Hz) is plotted on the horizontal axis and intensity of the signal (dB/Hz) on the vertical axis. 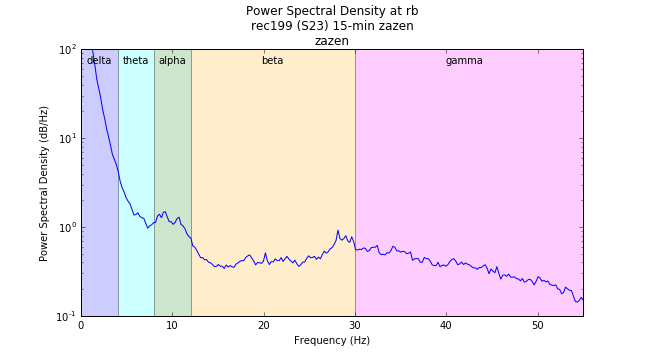 The graphs below show the spectral composition of the two selected intervals with frequency bands indicated in color. We see clearly how the beta and gamma intensity have increased over the course of a few minutes. 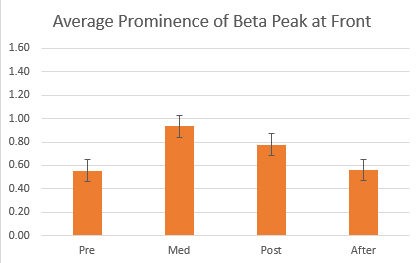 While there are several peaks in the beta and gamma bands, it is unclear at this time whether a given peak is characteristic of an individual over a long time, as the alpha peak seems to be, or whether different individuals display commonly identifiable peaks. This post is directed to programmers who are interested in seeing the code I’ve written to display graphs. Others may want to skip ahead. The Physiology Viewer program has undergone a reorganization that makes it faster and more stable. 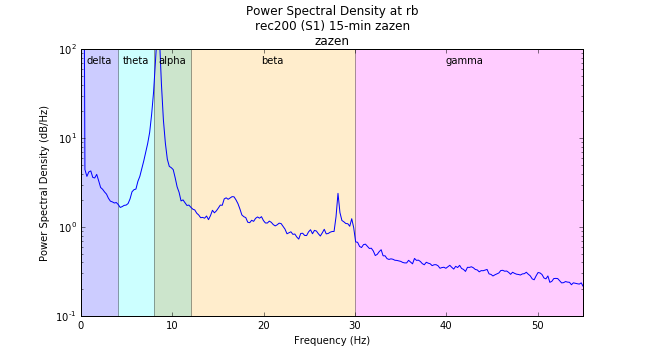 In addition, there are two new features for visualizing signals in the frequency domain: spectrograms and graphs of power spectral density (PSD). Finally, it is now possible to overlay the breath signal over a spectrogram, which provides a new tool for investigating the correlation between brain waves and breath. The combo box just beneath the title is used to select a particular recording. The text box displays comments referring to that recording. There are up to four lines to the right of the text box indicating which kind of data was recorded and at what sampling rate (EEG, heart, breath and button press). The check boxes to the right of Time Series, d, t, a, b, g correspond to the frequency bands delta, theta, alpha, beta and gamma. Data can be displayed either as absolute band power or relative. Median or mean values can be superimposed on the graph as desired. Check boxes p and v refer to respiration (pressure) and electrocardiogram (voltage) signals. The check box s refers to input from a button device ( a custom current probe connected to the LabQuest logging device). The letters c and m represent the Concentration and Mellow values that are automatically computed from a Muse proprietary algorithm. Since we don’t know what this algorithm is, I have not used it in my research, but have made it available in case we want to compare our results with these functions later. Check boxes j and k are used to indicate jaw clench and eye blink events, which are detected by the Muse headband. Jaw clench and eye blinks may be a useful way for subjects to indicate internal mental states. On the right-hand side is a graphic representing the subject’s head (nose facing upward, ears to the side). The four radio buttons surrounding the head graphic are used to select the sensor of interest. Clicking on the Display button brings up a graph or chart corresponding to current selection of Time Series, Spectrogram, PSD vs. frequency, Raw EEG, Radar Chart and Table. Checking the Overlay breath check box next to Spectrogram brings up a spectrogram with the breath signal superimposed. The dropdown list box next to Table provides options for mean, median, standard deviation and mean combined with standard deviation. The rows beneath Intervals, t_initial and t_final can be used to assign arbitrary names to time intervals within the session. Any region of interest can be named. The Save button must be clicked to save these data into the Excel workbook, EEG_CardioRespSessions.xls. 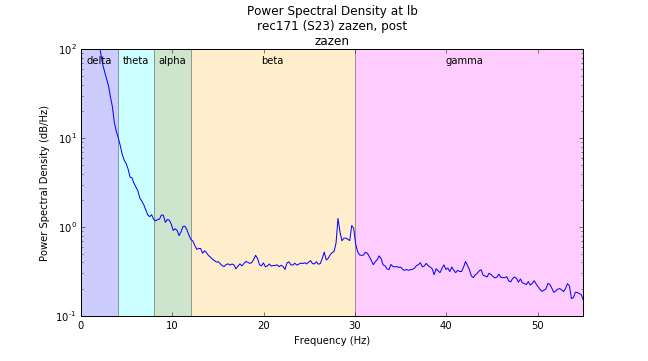 Below is an example of a spectrogram for an interval of zazen which shows the typical alpha signal around 8 Hz and an unusually strong signal in the beta band. 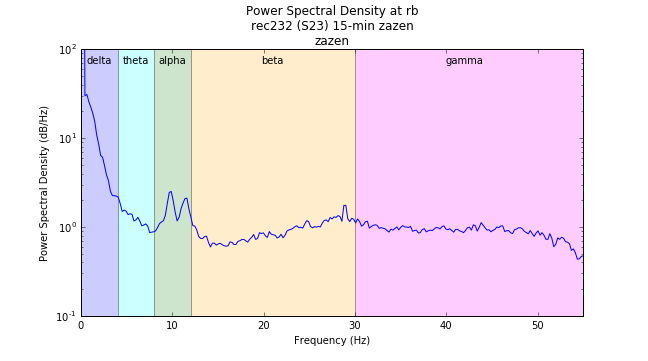 Below is the PSD spectrum for the same interval, showing the beta peak to be centered around 28 Hz. Both spectrograms and PSD graphs use the Fast Fourier Transform (FFT) algorithm operating upon sequential series of 1024 samples within the time series data. 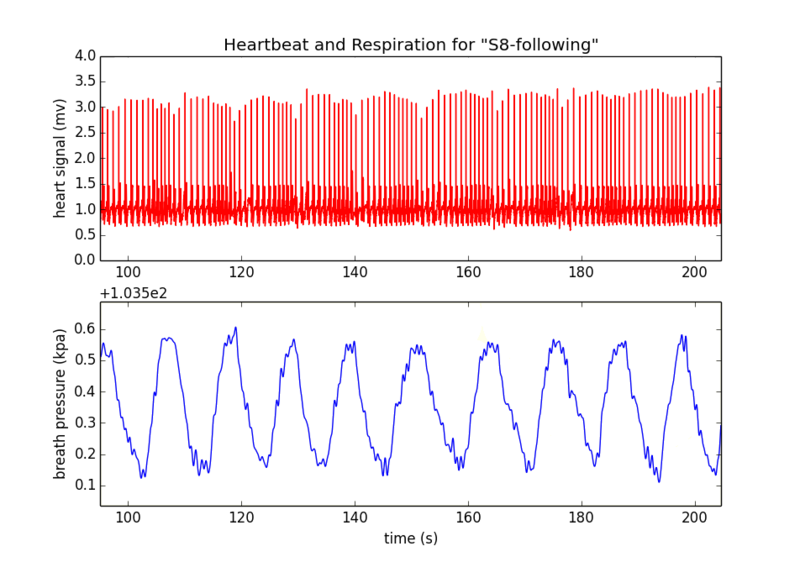 Spectrograms are generated using the specgram() function in the matplotlib library. Our PSD graphs are generated using the psd() function from the matplotlib library. 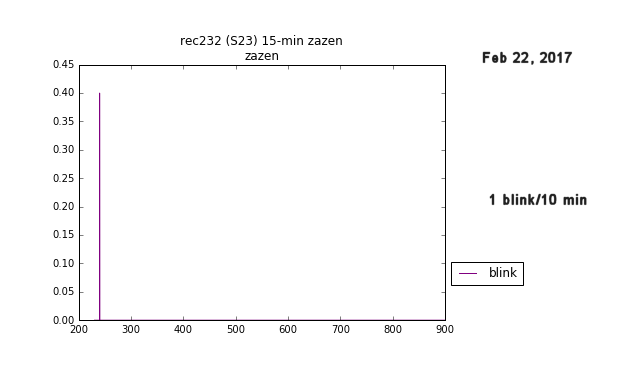 It uses Welch’s method with NFFT=1024, noverlap=512, the default ‘hanning’ window and a sampling rate of 220 samples/s. Color patches were added using the add_patch method of figure subplots. Recordings made during a 7-day retreat in September 2015 suggest that the average EEG power in beta and gamma frequency bands at the forehead (FP1 and FP2) increase uniformly during individual 20-minute meditation periods. Further, the maximum levels reached near the end of the periods grows gradually during the course of the seven days. During this particular sesshin, beta and gamma power reached maximum on the fourth day and remained relatively high during the remainder of the retreat. 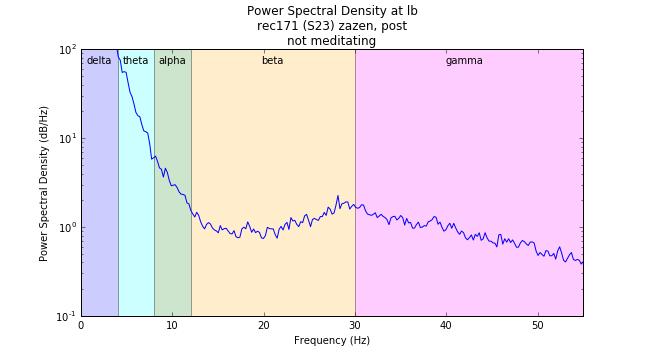 Starting the day before the meditation retreat began (Day 0) and continuing through the final day of a 7-day sesshin at Tahoma Zen Monastery, I recorded my brain waves during 20 minute sittings after the close of formal meditation. I used the same meditation technique for all sessions: eyes open, counting exhalations from the start of the period. While there is an indication for a slight increase in beta and gamma on the left side, it’s not very pronounced. The fact that the average power is increasing over the entire meditation period suggests that assigning a single mean power value to the whole period does not convey what’s really going on. 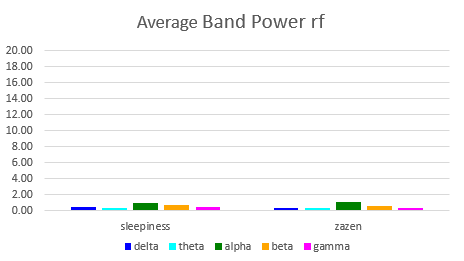 Let us now focus on a single meditation period at the end of Day 3, by creating an animation of radar charts of the absolute band power for all five frequency bands. Each frame of the animation represents the mean power values over 8 successive intervals of 120 seconds each (16 minutes total). 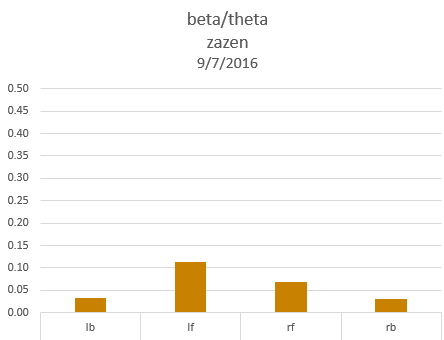 We see a steady growth in beta and gamma power over the course of this period. Beta and gamma power at the front sensors FP1 and FP1 reached their maximum mid-week and stayed higher than their initial values at the beginning of the retreat. Ten-minute segment of subject S6 doing zazen. Subject S6 sits regularly for at least 4 hours/day at Tahoma Zen Monastery. Ten-minute segment of subject S11 doing zazen. Recorded on the day after a 7-day sesshin and after having a morning cup of coffee. Ten-minute segment of subject S12 doing zazen. Subject S12 sits regularly for at least 4 hours/day at Tahoma Zen Monastery. Instructions for Subject 5 were to spend 7 minutes worrying about work, then 7 minutes of zazen, 7 more minutes of worrying, then 7 minutes of zazen. The chart above is for the first 7 minutes of zazen. Subject S12 suggested dividing his recording session into two segments: (1) traditional zazen (counting the breaths, eyes open) with (2) shikantaza (open awareness, eyes closed) Compare with rec38, S12 zazen above. These results serve as a good reminder to not jump to conclusions, or imagine that zazen has the same signature in all individuals at all times, even among expert practitioners. In the EEG patterns above we see many differences . 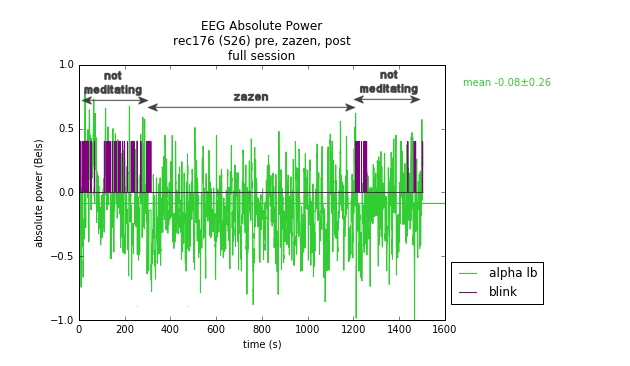 In an earlier post, I compared EEG patterns for short (3-minute) periods at the beginning of rounds during a “12-hour sesshin”, or “All Day Sit” at the Tahoma Zen Monastery. The three conditions I compared were counting the breath, thinking of tools and following the breath. 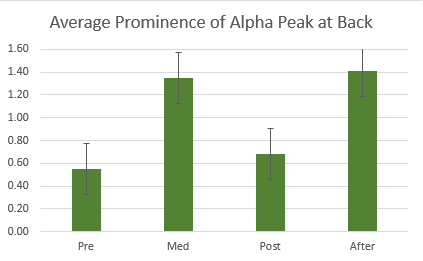 In the first and third conditions, the alpha component predominated, while in the second (non-meditative) condition, some beta and gamma appeared stronger, especially in the left front area. However, the story does not end there, as can be seen by looking at recordings for the entire rounds. Rounds of meditation lasted about 25-minutes. I made three recordings during three different rounds: “counting the breath”, “thinking of tools” and “following the breath (clear mind)”. 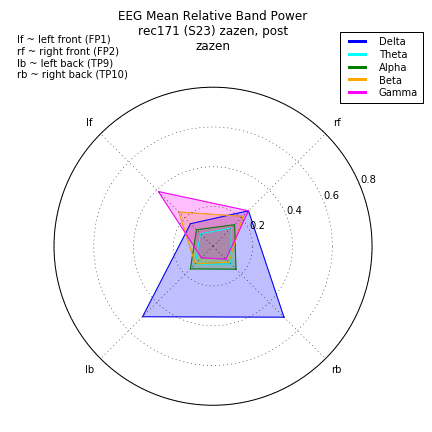 The graphs below show the EEG signal for the delta band at the electrode in the right back position and the beta band at the left front position. Choice of these particular bands and sensors is arbitrary, just a quick way to view changes over the course of a 24-minute session. Twenty-four-minute session of counting the breath. Data for delta frequency band at right back location (T10) and beta band at left front location (TP1). Twenty-three minute session of thinking of tools. A couple of things are immediately apparent. 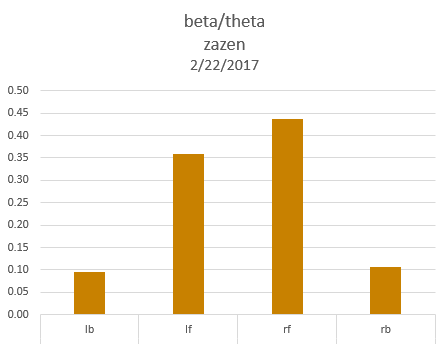 First, the beta values (brown curves) are on average not constant, but increase gradually for the first several minutes (600 – 800 seconds) before they reach a stable level. Second, there are spikes in delta values (blue curves) that become more prominent in the latter part of the session. This suggests that when looking for patterns in these three sessions, there may be different results when we compare time intervals at the beginning versus later intervals after the signals have stabilized. I decided to compare the final ten minutes of each round. The radar charts below show median relative power values in a 10-minute interval near the end of each session. 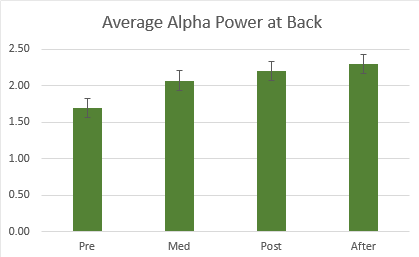 In all three charts, alpha is predominant at the back of the head. We see reduced alpha in the “thinking of tools” condition, which is not unexpected. But the high levels of beta and gamma for the meditative conditions of counting and following the breath are somewhat surprising. This pattern was not at all evident in recordings made during 3-minute intervals at the beginning of the round. Let’s compare side-by-side EEG patterns for these three conditions at the beginning and end of each round. In all three rounds, the alpha component decreased and the beta and gamma components increased over the course of the sitting. Comparing the results of the previous post and here, the message is clear: when the subject is engaging in a practice for 20 minutes or so, the pattern in the early minutes can be quite different from the pattern revealed in later time intervals. Generally, I participate in Zen sesshins (7-day meditation retreats) four times a year. Typically, I find that it takes 3-4 days before my meditation becomes fully energized. Initially, my mind is much more easily distracted by thoughts. By the fifth or sixth day, it feels like my meditation is more single-pointed and solid. In order to investigate this phenomenon empirically, over the course of a 7-day sesshin at Tahoma Zen Monastery in February, 2015, I recorded 20-minute meditation periods at the end of each day, around 10:30 pm after the conclusion of formal zazen practice periods. The following graphs show relative band power median values recorded at the four sensors of the Muse headband: lb (left back TP9), lf (left front FP1), rf (right front FP2), and rb (right back TP10). During the first ten minutes I sat with eyes open, zazen style, and the last ten minutes with eyes closed. The data displayed below are for 400 seconds in the middle of zazen. Error bars are indicated for one standard deviation. It’s interesting to note that in the two sensors near the ears (left back and right back), the alpha component stayed strong and relatively unchanged over the course of the seven days. 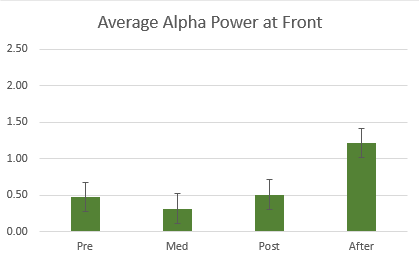 But at the front of the head (left front and right front), alpha power seemed to drop off toward the end of the sesshin while beta and gamma both increased. On the seventh day, especially, the higher frequency bands seem to dominate over the lower frequency bands alpha, theta and delta. In previous posts, we have examined my brain waves for meditative conditions of counting and following the breath with non-meditative conditions of thinking of things and reading. Now we begin to expand the investigation to include recordings of other people. Suddenly we are faced with a host of new variables—different people may have different “baseline” brain wave patterns, they may manifest their meditation practices in different ways, and they all have different levels of experience. Each person’s brain wave patterns no doubt change throughout the day as well, based on different experiences and different expectations of the future. So it may not be possible to characterize their mental states in any simple way. This series of recordings involved five subjects with varying meditation experience who were directed to engage their minds in meditative or non-meditative ways. Each session lasted about 20 minutes and included segments of 5-7 minutes of meditative (counting or following the breath) and non-meditative conditions (except for the second subject, S2 who sat three separate rounds of 20 minutes each). The charts below show results from subject S3 who was asked to meditate by counting her breath for seven minutes, then start worrying about something for the next seven minutes, then return to meditating by following her breath for the final seven minutes. She chose to worry about work. If you hover the mouse over each chart, you should see comments made by the subject immediately after the recording session. Click on a chart to see it full-size. We see a fairly dramatic increase in the relative power of delta band frequencies, which may be associated with the feeling of “panic” the subject describes when she is worrying about work. This subject, S3 has about 400 hours of meditation experience. The next two subjects chose a non-meditative condition of thinking about people they know and relationships they have had. Subject S2 exhibits a smaller fraction of delta power than subject S3 while counting her breath. In the second segment, when thinking about people the fractions of beta and gamma power go up, then return to a meditative pattern similar to the first segment. S2 has had about 500 hours of meditation experience. Subject S4 chose to meditate, then think of people, then return to meditating. S4 has about 500 hours of meditation experience. She exhibits a larger fraction of delta power when thinking of people than she does in the first segment of counting her breath. Also, her pattern of strong delta power in the second segment is quite different from subject S2 for a similar condition (thinking of people). Subject S13 chose to begin with a 7-minute segment of worrying, then meditate by following the breath, then return to worrying. The worrying segments are characterized by stronger delta rhythm while the meditation segment has brought in more beta and gamma. Subject S13 has about 900 hours of meditation experience. Subject S5 is a highly trained Zen practitioner, with over 18,000 hours of experience. He was asked to start by worrying about work for 7 minutes, then do zazen for 7 minutes, return to worrying for 7 minutes and end with 7 minutes of zazen. 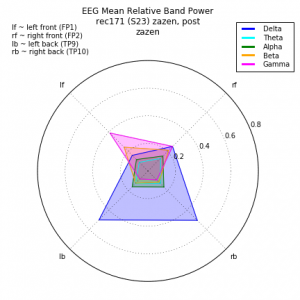 The predominant EEG power is in the delta, beta and gamma bands. Interestingly, the change in pattern from worrying to zazen and back is relatively minor. At least compared to the other subjects above, he exhibits less change in EEG pattern whether he is meditating or not. These data came from a 20-minute session with four 5-minute segments: drinking tea, counting my breath, thinking of tools and following my breath. During the first segment, I sat quietly and let my mind wander. Periodically, I reached for my teacup periodically and took a a sip. In the latter three segments, I continued sitting in zazen posture with open eyes gazing at a fixed point on the floor. During the first segment, drinking tea, the low frequency delta component was relatively strong. The question arises as to whether low frequency delta oscillations correspond to mind wandering (or only tea drinking!). Delta component has decreased while alpha component has increased. There is some increase in the beta and gamma bands as well. Beta and gamma power is definitely stronger during this segment and delta is less. Higher frequency bands (beta and gamma) are reduced and alpha has increased a bit. These results, taken from four successive 5-minute segments during a single round of sitting are consistent with the results from a previous post, which were taken from the initial three minutes of three separate rounds. In both cases, alpha predominates for counting or following the breath while beta and gamma are stronger during reading or thinking of things. What we see in the first three minutes of these sessions is similar to what we saw in the first minutes of “thinking of tools” sessions of the previous post. The following charts were obtained for a sequence of 5-minute segments: reading, following the breath and counting the breath. Eyes remained open during the entire recording. We see a striking difference between the non-meditative condition, reading and the two meditative conditions, following and counting the breath. 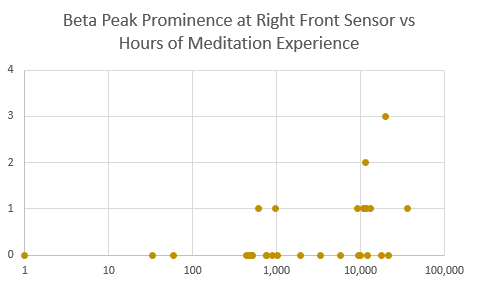 There are definitely stronger high frequency oscillations in the left frontal area for reading than for meditating. During meditation, at least during the first five minutes of a sitting, the alpha oscillations are stronger than for reading. Delta oscillations are stronger for reading than for meditation. As in other recordings, delta seems to correlate with focused concentration. Any differences between the two meditative conditions (counting or following the breath) are subtle. According to the neuroscience perspective, in which every experience results from electrical oscillations in the nervous system, we would have to say that while the differences may be subtle, they must be measurable in principle. I have always wondered what is happening in my brain when my mind is doing different things. Are there observable differences in brainwave patterns for when I am meditating vs. not meditating? Are there different patterns for different styles of meditation? Is it possible to see changes over the course of minutes or days? My practices of counting the breath and following the breath are two different styles of meditation. In the practice of counting the breath, I am counting exhalations, internally saying to myself, “one, two, three…”. It can be either counting to ten and repeating, or just counting continuously through the period of meditation. It requires effort to stay focused on the counting process–otherwise all kinds of extraneous thoughts intervene and I find myself daydreaming, stepping from one thought to another. Without the effort, my mind tends to return to a random walk of thinking. The practice of following the breath seems to follow naturally from the practice of counting. That is, when the jumping around has been quieted by the counting practice, then thoughts tend to subside and simple awareness remains. These are the times when I feel my mind is clear. I wondered whether it would be possible to see a brainwave signature for a clear mind, especially in contrast to the default mode. To do so, I needed to compare it with conditions of non-meditating. An example of a non-meditative condition would be thinking of things—seeing objects in the minds eye, naming them and seeing where they are located. I have a workshop in the garage with lots of different tools on the wall. In my mind’s eye, I can see where each of these tools is hanging, so I can occupy my mind for several minutes just thinking of all the different tools, seeing an image of each, its name and where it is located. When I run out of tools in the garage, I can think about tools in the kitchen. So “thinking of tools” seemed like a good example of a state of mind which is not meditating. Below are radar charts for counting the breath, thinking of tools and following the breath for this period. An alpha rhythm predominates in all four sensor locations. In the next segment, I focus on thinking of tools in my garage. the Beta and gamma rhythms are more pronounced. Finally, I return to my practice of following the breath. Once again, alpha is stronger than other frequency bands. In the first and third segments, when counting the breath or following the breath (both with eyes open). When thinking of tools there is more beta and gamma activity in the front of the head (also with eyes open). One of the oldest and most studied phenomena of EEG research has been the study of alpha rhythms. These oscillations, at a frequency of around 10Hz occur reliably in awake healthy individuals in a relaxed state with their eyes closed. The beginning instructions for zazen meditation are to sit quietly, in an alert but relaxed state, to count one’s breaths while keeping the eyes open. The first experiment I wanted to try was to do this simple exercise of counting the breath and compare the conditions of eyes closed with eyes open. In both cases, I tried to avoid moving my eyes but instead keep them directed at a point on the floor a few feet in front of me. I set a timer on my smartphone that gave me soft spoken word “Now” every 7 minutes. Sessions last 21 minutes each and included alternating segments of eyes open and eyes closed, sometimes starting with open, other times starting with closed. I tried to keep everything else the same during the recordings, which included four segments of eyes closed and four segments of eyes open. The radar charts below show median values averaged over the four session segments. While alpha rhythm was stronger overall with eyes closed, the higher frequency bands beta and gamma were more prominent with eyes open, especially in the left frontal region. This confirmed that yes, indeed, from my brain, different EEG patterns result from different body conditions. Brain waves are the time-varying electrical signals measured between two points on the head, for example between the center of the forehead and some other point on the scalp. The resulting oscillations are the summation of voltages due to innumerable sources within the brain, primarily neurons in the cortex. Different populations of neurons fire in synchrony with their neighbors at frequencies ranging from one cycle per second (1 Hertz, written 1 Hz) to over a hundred cycles per second (100 Hz). At any given point, a cacophony of signals can be recorded and at first blush, they make no sense at all. For example, here is the raw EEG signal from location TP10 (near my right ear) during a 7-minute recording as I drank a cup of tea. This particular recording was 21 minutes long, with four 5-minute segments under different conditions. 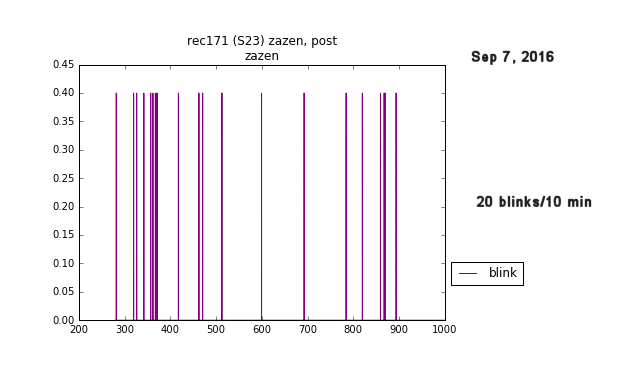 The plot above shows only the first segment, “drinking tea – 1”. To begin to understand this complex signal, we can decompose it into different frequency bands. What do we mean by that? By adding together five simple sine waves of different frequencies we quickly get a complex waveform. The amount that each frequency band contributes to the overall signal is computed using what is known as the Fast Fourier Transform (FFT). The band power in each frequency range can then be expressed as a fraction of the total band power. An FFT algorithm is built into the hardware of the Muse headband device and during a recording, the absolute and relative band power values for five frequency bands at four sensors are streamed wirelessly to a smartphone or computer. 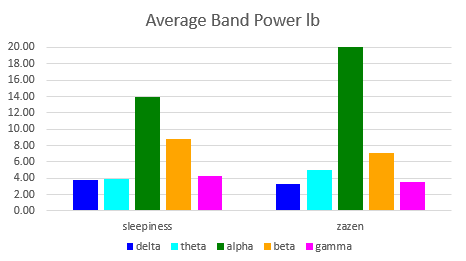 For example, from the 7-minute tea-drinking recording above, the graphs of relative band power for delta, theta, alpha, beta and gamma bands were obtained and are shown below. In each graph, a median value for the indicated time interval is displayed as a horizontal line. We see that low frequency (0.5 – 3 Hz) delta waves predominate in the right front temple area (rf) and medium frequency (8 – 15 Hz) alpha waves are strongest in the left back (lb) region near the left ear. We now have tools for examining brain waves in more detail. To explore the physiology of zazen, we began by recording respiration and heart rhythms using a respiration monitor and an electrocardiographic (ECG) sensor. Eight subjects participated in the study. Some had training in zazen; others had experience with other meditative traditions (Vipassana, Yogic). Electrocardiogram and respiration data were collected for both meditative (counting the breath) and non-meditative (reading) conditions. Sessions were about 20 minutes long. 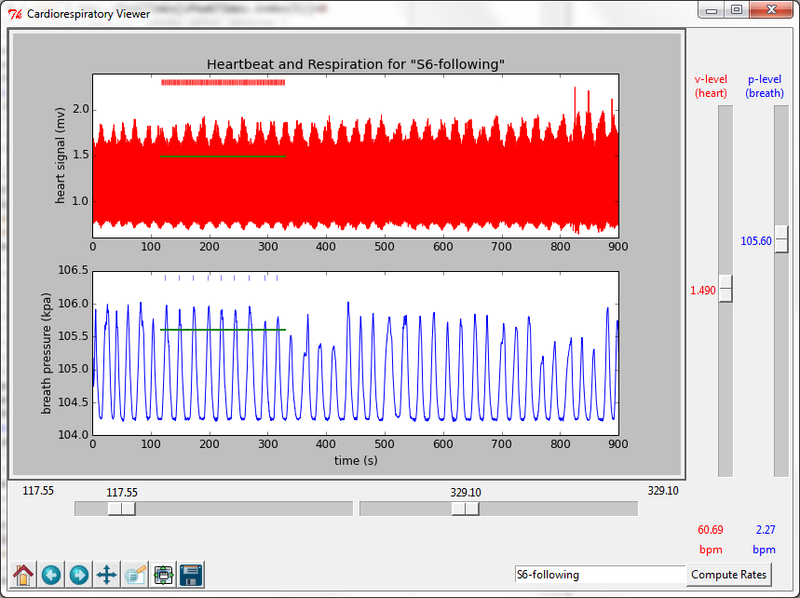 A Cardiorespiratory Viewer computer program was developed to aid in the display and analysis of the breath and heart data. Breathing rate among eight subjects for meditative vs. non-meditative conditions. Rates during reading were typically double or greater compared to meditation. At least among these eight subjects, trained in Zen, Vipassana and Yoga, breath rate was substantially slower (by at least a factor of two) during meditation than during reading. This is not surprising, given that these ancient traditions have a common origin. In addition, we noted that heart rate did not vary appreciatively between the meditation condition and non-meditative reading. Again, this is expected as our heart rate is not usually under our conscious control and it is generally not part of meditation training. Heart rate among eight subjects under meditative and non-meditative conditions. Rates were not significantly different during counting, following the breath or reading. We have seen examples where the respiration rates for experienced meditators are lower than those for novices. What about patterns of inhalations and exhalations? 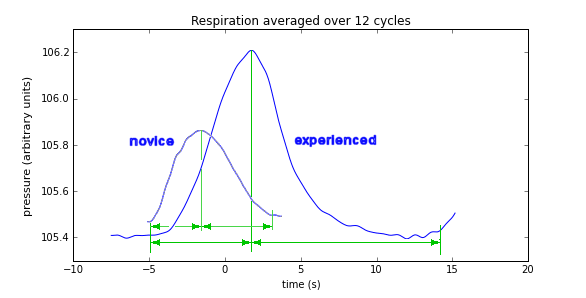 Plotting the average respiration waveform for a novice (<200 hrs) and an expert meditator (>5,000 hrs), we see that the exhalation time is 50% longer than the inhalation time for novice and 70% longer for the expert. Ratio of exhalation to inhalation time for novice is 1.5 while for expert is 1.7. Furthermore, the expert breathes much more deeply than the novice, as indicated by the difference in pressure from the bottom of the exhalation to the top of the inhalation. 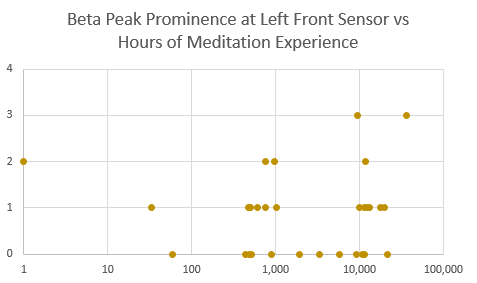 The plots below show electrocardiogram and respiration signals for a 20-second segment of meditation. Heartbeat and Respiration during meditation. Note the increase in amplitude of the ECG signal during exhalations. During exhalations, the amplitude of the waves in the upper plot (the sharp spikes in the electrocardiogram, known as R-waves) increase while they decrease during inhalations. A comparison of ECG signals for a novice and an experienced meditator are shown below. Heartbeat and respiration for Subject 8, a relatively inexperienced meditator. Amplitude of R-wave increases by ~10% during exhalations. Heartbeat and respiration for a highly trained meditator. 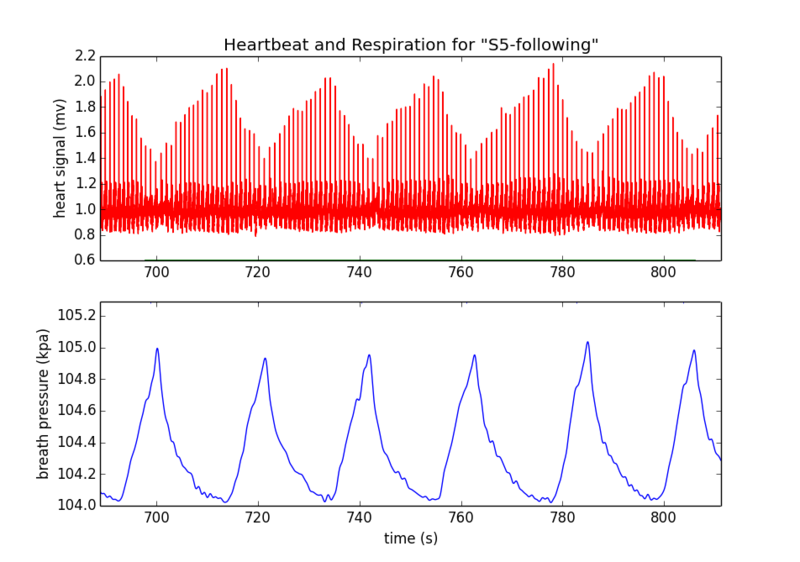 Amplitude of R-wave increases by ~50% during exhalations. For novice meditators, this effect was small (roughly 10% change in R-wave amplitude, as shown in the upper figure, above). For highly trained meditators the effect was quite pronounced (roughly 50% as shown in the lower figure, above). The amplitude of the R-wave is an indicator of the strength of the signal from the heart when the left ventricle is forcing blood out to the rest of the body. The electrical resistance of the body between the heart and the ECG electrode on the surface of the skin changes as the lungs fill with air and then collapse. After consulting with a cardiorespiratory expert (an anesthesiologist), I have concluded that this dramatic change in R-wave magnitude reflects the deeper breathing of the trained meditator—as the intrathoracic cavity collapses during exhalation, the gap between the heart and the outer surface of the body (where the ECG signal is measured) shrinks, thereby reducing electrical resistance and resulting in an increased amplitude of the R-wave. In the following plot of respiration during meditation, we see a regular repetition of inhalations and exhalations with a wave-like quality. My breath recorded on the 7th day of a meditation retreat. To compare respiration rates for meditation and non-meditative activities, I recorded my breath using a Vernier LabQuest device connected to a gas pressure sensor and a respiration monitor belt. 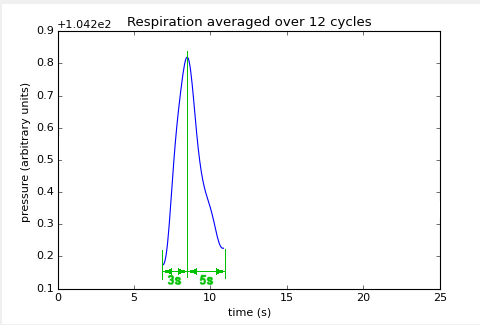 the first plot below shows my respiration sitting quietly and reading. The second plot is a recording of meditation during the 7th day of a meditation retreat. Respiration while sitting quietly and reading. Breath rhythm was variable. Occasionally I took a deep breath. Average breathing rate was 14.6 breaths/min. Breath recorded on the 7th day of a meditation retreat. Breathing rate was 2.85 breaths per minute. Below is a comparison of breathing rates for various other activities. Comparison of respiration rates for various activities, including meditation. Clearly my zazen practice is characterized by a slower breath rate compared to other activities during the day. In September 2014 I enrolled in an online course Exploring Neural Data offered by Brown University via coursera.org. The basic premise of the course was that students would be able to access data coming from various neuroscience labs around the country and learn techniques for analyzing that data, forming hypotheses and testing them. Participation in the course required learning the Python programming language. It sounded like an opportunity I couldn’t pass up. I had already completed two coursera online courses, Duke University’s Medical Neuroscience and Hebrew University of Jerusalem’s Synapses, Neurons and Brains, which gave me a bit of orientation to neuroscience (my background is physics and astronomy). I also discovered some good online tutorials on Python, so I could start familiarizing myself with a new language. The final project for the Exploring Neural Data course was to apply some of our programming skills to a new data set. I chose to collect respiration and and electrocardiogram (ECG) data for subjects during meditation and reading. I chose to develop a new application I called the Cardiorespiratory Viewer. Written in Python, using the Anaconda Spyder programming environment, it imports program modules from the Tkinter, numpy, scipy and matplotlib libraries. 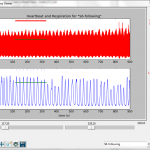 The application reads data files generated by the LabQuest recorder, displays simultaneous plots of EKG voltage and breath pressure, and enables the user to specify time segments and signal threshold levels for analysis.